Born in Streatham, London, Michael Baatz was educated at Oxford University (MA in Jurisprudence). After service in the Royal Air Force as a Pilot-instructor at the RAF Central Flying School he held various staff appointments in industry before taking up university administration appointments first at Edinburgh University in 1957 and then Birmingham University. In 1963 he was appointed Secretary to the Collegiate Council and Deputy Academic Registrar of the University of London, being promoted to Academic Registrar three years later. 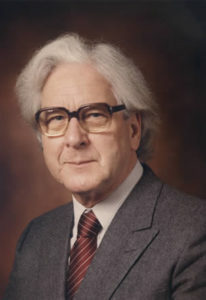 In 1973 Baatz moved to the University of Leicester as Secretary, Academic and Finance Officer, holding this office through to his retirement in 1983. Among his public and community activities from 1974 to 1982 he was a member and then Chairman of the Board of the Leicester Theatre Trust (Haymarket Theatre), and he led the Leicester Literary and Philosophical Society through its 150th anniversary year in 1984-85. International service included a consultancy to the University of Cape Town in 1976, and a Commonwealth Fellowship in 1977. From 1983 to 1984 he was a member of the Department of the Environment’s Committee on Social Effects of Mining Subsidence, which was the subject of his Lit. and Phil. Presidential Address, and during 1984-85 he was Secretary to the Committee for Efficiency Studies in Universities. Presidential Address: Under-Mining Transactions LLPS Vol. 79 (1985), pp. 7 – 23.